It wasn’t to be a happy event for either car, they both failed to finish as a result of accidents. The competitiveness of Vittorio Jano’s newish D24 design was underlined by Alberto Ascari’s win in another of the cars in a time of 11 hours 26 minutes and 10 seconds. 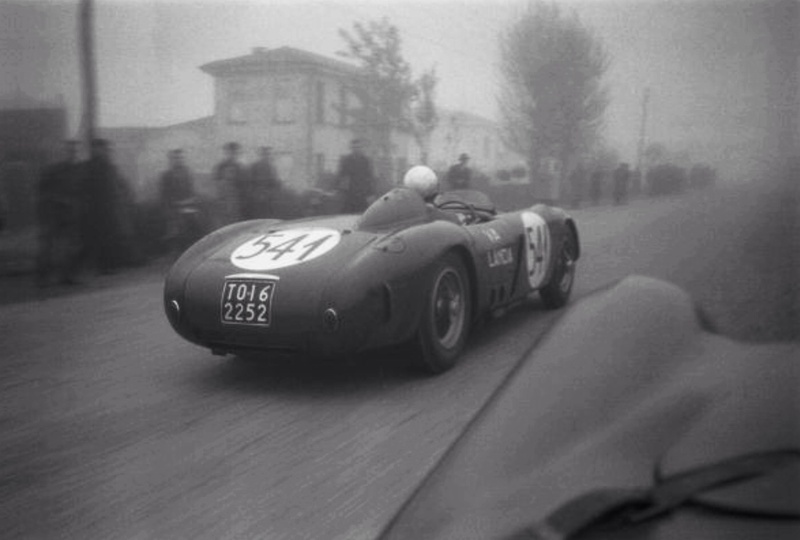 Vittorio Marzotto’s 2nd placed Ferrari 500 Mondial was 34 minutes in arrears. Piero Taruffi’s Lancia led the race early from Brescia, that year fog replaced the more usual rain, he was first into Ravenna with a lead of 1.5 minutes. 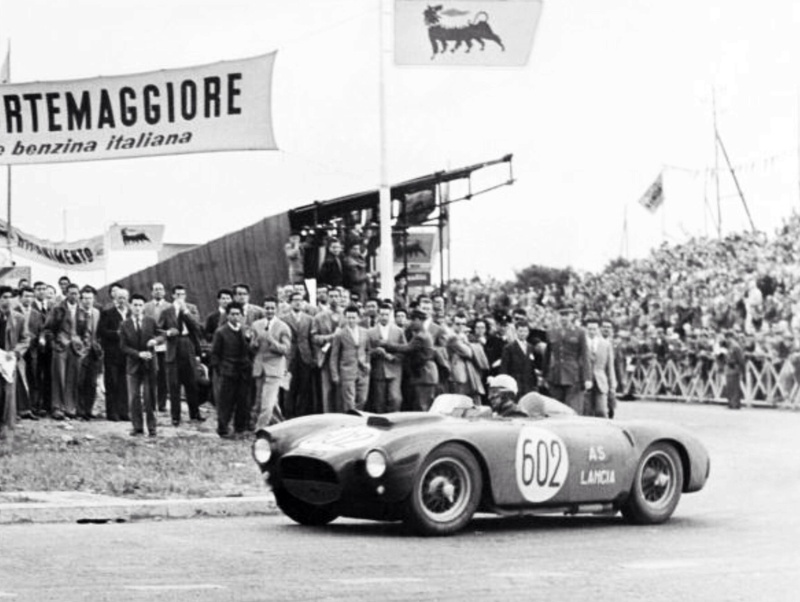 Castellotti retired his Lancia by Rome, soon Piero’s car developed an oil leak so he too retired. Ascari then assumed the lead but on the home leg north his throttle return spring failed, a rubber band provided a temporary repair. By Florence he was ready to retire but was prevailed upon to continue, then by Bologna all of the quick Ferrari’s had retired so the final 200Km into Brescia was a ‘cruise’ if the final hours of a race lasting 11 plus hours can be so described! Gianni Lancia and Vittorio Jano created some stunning sports and racing cars in the early 1950’s, at least the Lancia heir could look back on them as a legacy when he was forced to cede management of the company such was its parlous financial state into 1955. The new D24 ended 1953 with a stunning 1-3 in the November Carrera Panamericana in Mexico; Fangio won from cars driven by Piero Taruffi and Eugenio Castellotti. 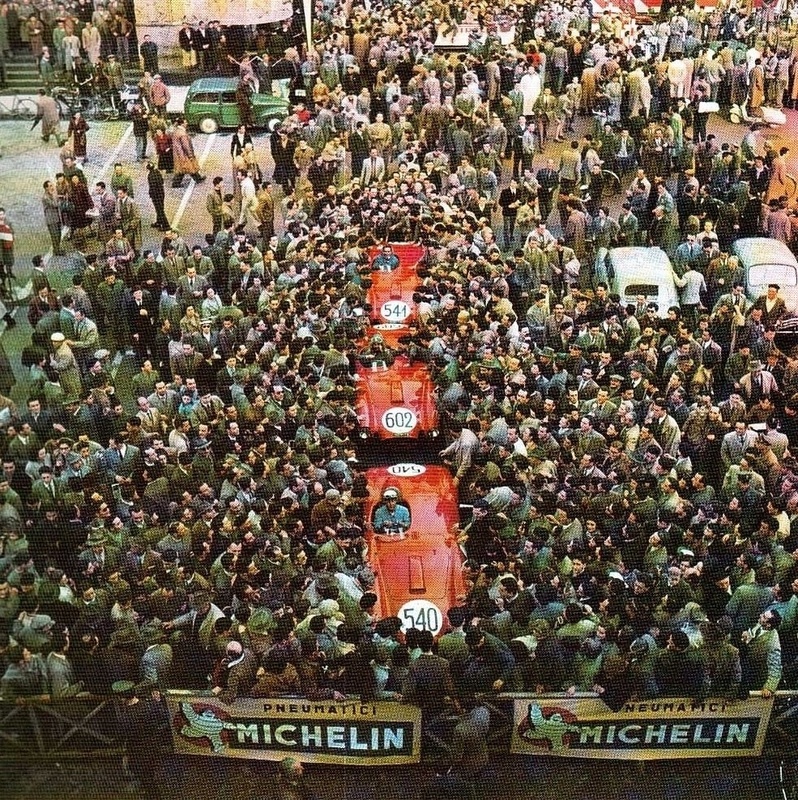 Felice Bonetto’s death in a D24 during the event somewhat muted the joy the team felt in victory, to say the least. 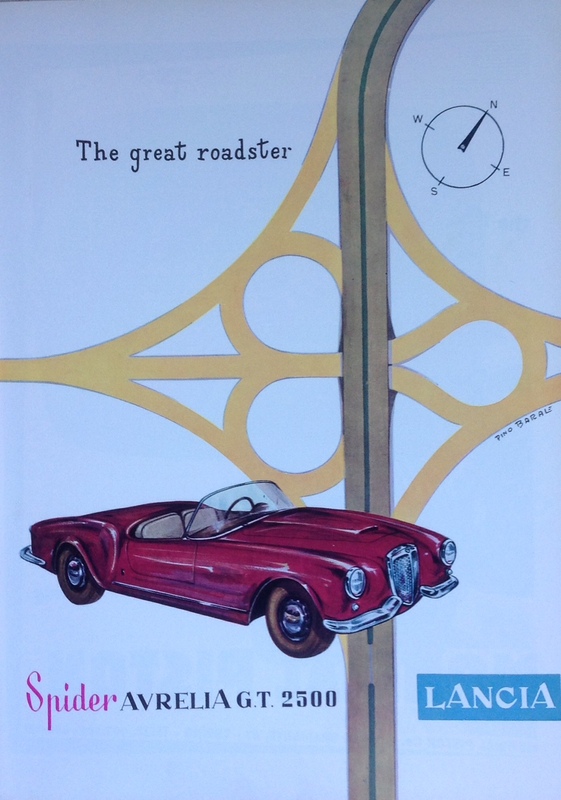 The D24 evolved from the D23 Spyder, itself begat by the D20 Coupe design. Jano’s development times were short, the D23 made its race debut at the Monza GP on 28 June (2nd Bonetto) and the D24 at the Nurbugring 1000Km on 30 August (Taruffi/Manzon and Fangio/Bonetto both DNF). The wheelbase of the D24’s tubular steel spaceframe chassis was marginally reduced. The quad-cam, chain driven, 2 valve, triple Weber 46DCF3 fed, 60 degree V6 engines capacity was increased from the D23’s 3102cc to 3284cc with power in the range 240 to 270bhp @ 6500rpm for each of the two engines. The cars late 1953 speed carried through into 1954 with the Taruffi/Manzon D24 leading the Sebring 12 Hour until an engine failure about an hour before the end. Despite that the car completed 161 laps compared with the 168 of Stirling Moss and Bill Lloyd in the winning OSCA MT4. 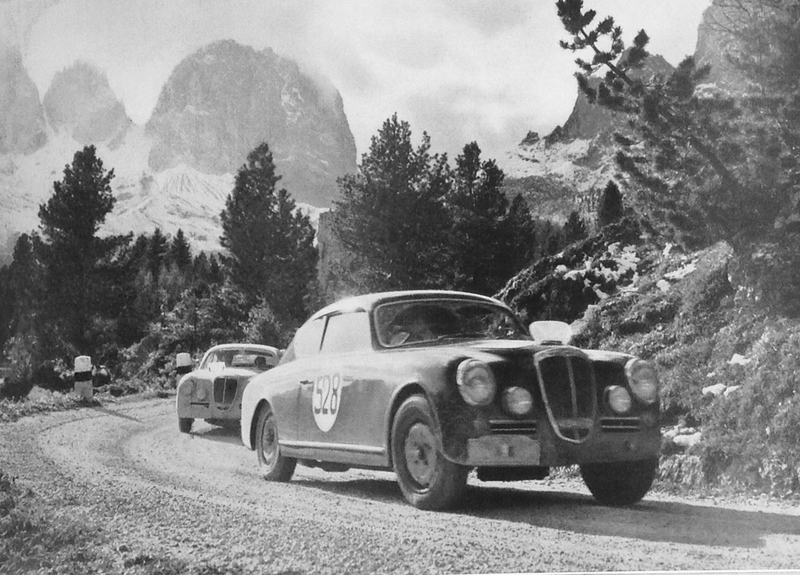 Wins at the Targa by Taruffi, not a championship round in 1954, and 4th & 6th in the Tourist Trophy gave Lancia 2nd place in the Manufacturers Championship with 20 points to Ferrari’s 38 despite not entering Le Mans. 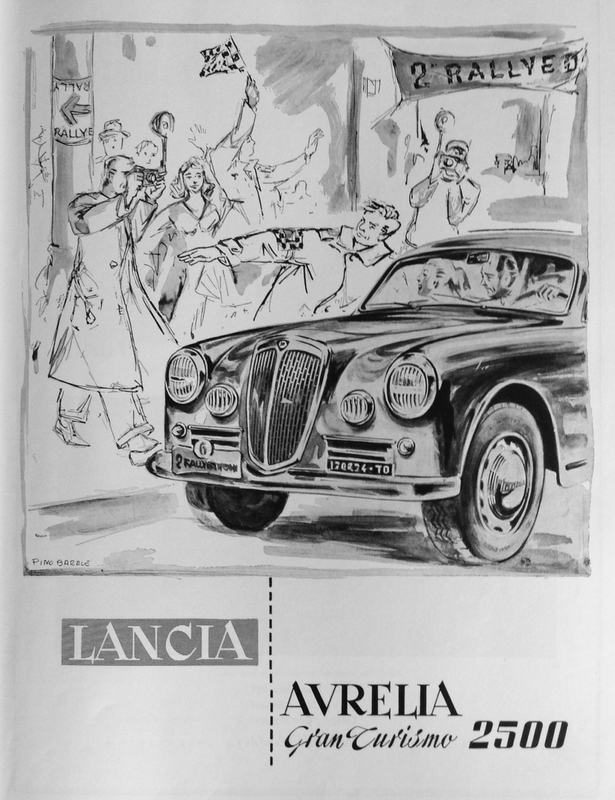 Lancia did get plenty of promotional rub-off for their considerable investment in Italy with the cars winning a swag of races and hillclimbs in ’54. Castellotti won the Treponti-Castelnuovo, Coppa Firenze-Siena, Bolzano-Passo Mendola and the Aosta-Gran San Bernardo. Taruffi took the Giro di Sicilia, Catania-Etna and Coppa d’Oro di Sicilia and Villoresi the Oporto GP. Lancia’s F1 program absorbed plenty of resources, the D50’s first race was the final ’54 championship round on 24 October, the Spanish Grand Prix at Pedralbes, Barcelona. Alberto Ascari’s jewel of a Lancia D50 started from pole and led until clutch problems caused him to retire on lap 9. 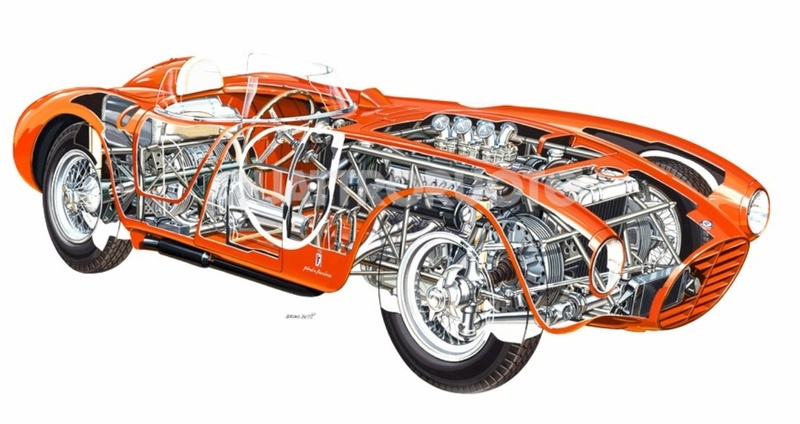 Despite the competing GP car program Jano evolved the D24 design later in the year by increasing the capacity of the V6 to 3550cc for which 300-305bhp @ 6500 rpm was claimed. Two of these cars dubbed D25 were entered for Ascari/Villoresi and Fangio/Castellotti at the Tourist Trophy, Dundrod in September but both retired with diff and engine failure respectively. Taruffi/Fangio and Manzon/Castellotti were 4th and 6th in D24’s. The timing of the GP debut was unfortunate as the D24 was a mighty fine, fast car which deserved to have been the primary competition focus of Lancia that year. The D50 changed the course of GP history in terms of its brilliant design, it’s contribution to Lancia’s fiscal disaster and of course giving Ferrari a car which won the world drivers championship for JM Fangio in 1956. But the D24 could conceivably have won Lancia a sportscar manufacturers championship in 1954 had the necessary, exclusive effort been applied to that campaign. Unitary chassis construction, 2451cc OHV V6, Weber twin throat carb, circa 118bhp @ 5000rpm. 115mph. 4 speed box but the transaxle was innovatively located at the rear as are inboard mounted drum brakes. Front suspension sliding pillar, semi trailing arms at rear, De Dion tube on fourth series cars. The car was remarkably advanced for its time, one of a series of stunning Lancia’s designed by Jano, the ‘apex of which’ was the D50 GP car which first raced at Barcelona in the 1954 Spanish Grand Prix. B20 Coupe body Ghia designed and Pininfarina built, Francesco de Virgilio the senior member of Jano’s design team.